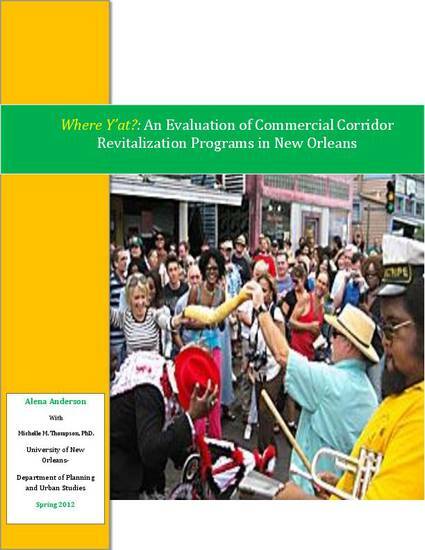 This report highlights several Commercial Corridor Revitalization Programs (CCRPs) in New Orleans, LA. Designated Main Streets programs and other Business and Property Owners Associations (BPOAs) have been included to illustrate the diversity of approaches to increasing local economic development along vital commercial corridors of the city. An examination of the national Main Street Program and how this is adopted by local organizations is described. Commercial Corridor Revitalization Programs (CCRPs) are used as vehicles to encourage and inspire urban economic development. Based upon interviews with program managers and community residents, the impact of Commercial Corridor Revitalization Programs(CCRPs) is summarized. Since the goals of Commercial Corridor Revitalization Programs (CCRPs) are as unique as the neighborhoods they reside in, there has not been way to summarize the findings in a heuristic or best practice with each case study. This is a first look at how the program goals have been applied and can be a starting point for discussions on if/how/why one program may be considered more relevant and/or successful than another.